A classic example is the backpack. Back in the 1970s and 1980s, it was standard for backpackers to use external frame backpacks. For carrying heavy loads, external frame backpacks are the best (mountain porters in Taiwan always use external frame backpacks for this reason). But external frame backpacks are also heavy, especially the older models (there are some new models which have pared down the weight while still having some of the advantages of external frames). A typical external frame backpack weights 4+ lb. (2+ kg). A typical internal frame backpack can weigh only about 2 lb. (1 kg), and some of the frameless backpacks can weigh even less than that. If one has minimized the weight the rest of one’s gear, then having a pack that handles heavy loads becomes less relevant, so it makes more sense to cut off the extra pounds (kilograms). This change only happened because enough people questioned the previous orthodox viewpoint that external frame backpacks were essential. And once someone has a backpack, they can choose to modify it to reduce its weight – if it has a bunch of bells and whistles for ‘convenience’ that aren’t strictly necessary, they can sometimes be cut off to reduce weight. For example, the backpack I’ve used in the past two years for hiking came with an internal frame, which I removed to reduce its weight (thus it is now effectively a frameless backpack). This illustrates another key idea of ultralight backpacking – one can modify one’s gear to fit owns own needs, rather than only using it in the form that it comes out of the package. All of the major categories of backpacking gear have similar equivalents – sleeping bags (heavier) vs. sleeping quilts (lighter), full-size sleeping pads (heavier) vs. partial-size sleeping pads (lighter), double walled freestanding tents (heaviest) vs. single-walled non-freestanding tents (lighter) vs. tarps (lightest). This is a tarp (lighter than a tent), and inside is a sleeping quilt (lighter than a sleeping bag), and a 3/4 size sleeping pad. It was all enough to get me through this snowstorm without hypothermia (in fact, I was quite warm). If I had lacked any of those three items (except possibly the sleeping pad if I had made a ‘bed’ of pine needles/pine cones) I probably would have gotten hypothermia. The ‘ultralight revolution’ has been effective at increasing the popularity of backpacking, especially among people who have less athletic ability, and very effective at increasing how much people enjoy backpacking. Yet there are people who prefer ‘light’ over ‘ultralight’, as well as people who insist that heavier gear is worth lugging the extra weight, at least for themselves. For example, the very few backpackers who use external frame backpacks today tend to be very enthusiastic about external frames. They claim that some other backpackers look down on them, as if they were too ignorant to know that weight is important and lighter backpacks exist. Personally, I admire the backpackers who choose the external frame backpacks for sticking with what they want rather than following the (lightweight/ultralight) herd, and I enjoy talking with them. I myself choose not to use an external frame backpack, but I can tell that a few backpackers really like using them. 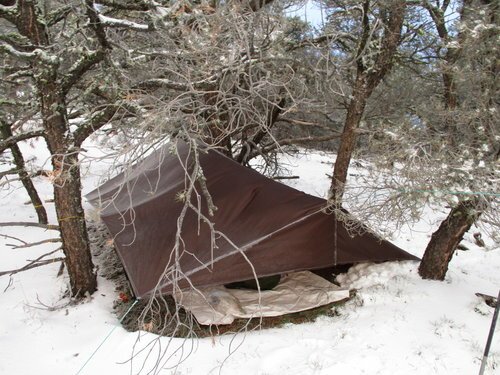 Sometimes there is pressure within the long-distance backpacking community to shed items that are not strictly needed (such as pressuring people to give up external frames for backpacks), but pretty much all of the ‘experts’ on ultralight hiking (including Ray Jardine) recommend taking anything that improves the experience of the journey enough to justify the weight. For example, many people who are very devoted to ultralight hiking will still carry a book to read, even though books are heavy. I’ve done this myself (and I’ve also used paperback books as pillows, which means I didn’t need to carry a pillow in addition to the paperback book). Likewise, stoves are not necessary for hiking in California in the summer (all of my summer hikes in California have been stoveless), yet many long-distance hikers, even the ones who consider themselves to be ‘ultralight’, carry stoves because they want hot coffee in the morning or they really like eating hot dinners or something. You’ll hear a lot of talk about non-essential gear as being “luxury items,” as if that’s a bad thing. The thing about luxury items is that they do serve a purpose. That purpose is making you feel psychologically safe and happy. I once watched a shakedown where an ultralight gear critic told a devout Christian that his Bible wasn’t an essential part of his pack. I’ve hiked thousands of miles with two stuffed turtles weighing 10.4 oz total. But those turtles, just like that Bible did for my fellow hiker, serve a distinct purpose to the person carrying them. If you are familiar at all with Marie Kondo and her ideas, I’m sure you’ve already seen some of the parallels. One of her key principles is that it is best only to keep objects which tokimeku, which is imperfectly translated into English as ‘spark joy’. Unsurprisingly, ‘spark joy’ is a metric which does not work for everyone all the time, and even after learning what tokimeku means I do not think it is the sole metric I want to use, unless I interpret it very broadly to include things such as ‘necessary to stay alive’ ‘necessary to remain consistent with my personal values’ etc. Marie Kondo herself mentions that some things have such high utility value that it is necessary to keep them even though they do not tokimeku (the example she gives is the lease for an apartment). One common criticism of the ‘spark joy’ metric is that many people (especially people who haven’t read Marie Kondo’s books carefully and noticed that she says that some things are too necessary to keep even if they do not tokimeku) is ‘but I need some things which do not spark joy’. I think this video has a good discussion. My take is that if ‘spark joy’ or ‘tokimeku’ do not work for an individual, it is good for that individual to find a metric which works better for them, and they can still use the rest of the KonMari method if they wish (it is also okay it they do not). Though I have not read The Gentle Art of Swedish Death Cleaning, my understanding is that it presents the alternative metric ‘will this thing help or burden other people after I am dead?’ (and I found this video worth watching). I don’t think it is the best metric for me to use at this point in my life (and it isn’t even recommended for people under the age of 50), but I still find the concept interesting. Ultralight backpacking has the opposite hangup – when people talk about ‘KonMari’ there is friction in justifying keeping necessary things even if they do not ‘spark joy’, whereas in ultralight backpacking there is friction in justifying carrying things which ‘spark joy’ even if they are not physically necessary. But even though the hangups are in different directions, I find the discussions otherwise similar (especially in their tediousness – I think it is bloody obvious that it is okay to keep/carry both things which ‘spark joy’ and things which are absolutely necessary, both in backpacking and in everyday life). Another commonality is that, at one point in the book, Marie Kondo says that there are ultimately only two reasons we keep things: attachment to the past, and fear for the future. She treats this neutrally, but some people interpret her as saying that it is ~bad~ to keep things for these reasons. Likewise, a common saying among long-distance hikers is ‘we carry our fears’. What we carry shows what fears we have for the future. For example, people who carry ice axes are obviously afraid of a certain type of potentially fatal mishap. People who carry a lot of water are obviously afraid of dehydration. People who carry any type of rain and/or snow shelter are afraid that it might rain and/or snow and there will not be a permanent shelter around. It is good to have some fear for the future. For example, while going through the notorious stretch of the Pacific Crest Trail without any reliable water sources for 42 miles (67 km), being afraid of dehydration is extremely reasonable. There are multiple strategies hikers use to get through that section (I carried a lot of water and chose to hike that section during a cooler season), but pretending that dehydration is not a risk is asking for trouble. On the other hand, carrying a 0 degree Fahrenheit (-18 degree Celsius) sleeping bag during a summer hike in California because one is afraid that California might have a historically unprecedented summer cold spell is probably too excessive (if one is carrying that 0 degree sleeping bag because it is the only sleeping bag one owns and one doesn’t want to buy another sleeping bag, that is more reasonable, though I would still advise trying to arrange a sleeping bag swap if that is at all feasible). Likewise, I store food at home because I am afraid that there will be times when I will be hungry at home and not want to go outside to get food. My experience is that this happens quite often, so storing food at home, even if I am not hungry at the moment I am bringing food home, is an obviously good decision. Backpackers generally do not carry things because of attachment to the past (though there are exceptions), but there are many situations in everyday life where an attachment to the past is a positive thing. Both ultralight backpacking and the KonMari method are, to a large extent, about getting to know all of your material belongings, being realistic about the cost of carrying/keeping those items, asking whether they actually contribute value one’s life or whether they are only being kept due to convention/habit/lazy thinking/unreasonable fears/etc., cutting out the things which do not provide enough value, and then finding a good way to organize what is being carried/kept (yep, ultralight backpacking philosophy has quite a bit to say about how to organize gear, just as Marie Kondo has quite a bit to say about how to organize stuff). To some extent I think of the KonMari method as a technique for extending the principles of ultralight backpacking to my entire life, not just the parts of my life when I am backpacking. This entry was posted in Introspection, Travel and tagged backpacking, hiking, KonMari, Sara Joins the Scary Konmari Cult, ultralight by Sara K.. Bookmark the permalink. Nice comparison. I’ve been slowly Marie Kondo-ing both my backpacking set-up and my home. There are definitely parallels. Indeed, I thought I could cover what I wanted in a single post, but some things did not fit, so I may (or may not) write additional posts comparing KonMari and ultralight backpacking. BTW, if you are letting go of any backpacking gear in good condition, the website GearTrade could be useful. haha love this sentiment! I watched 1 episode and was like… oh! I already do this on a regular basis.